Chesterfield Symphony Orchestra was founded in 1982 to provide orchestral music for Chesterfield and the surrounding area. Beginning with a group of just fifteen the orchestra has flourished into a group of almost fifty permanent players. 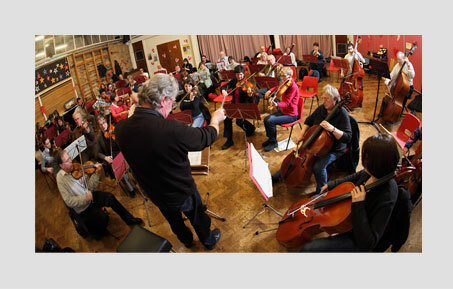 Its aim is to provide a wide range of orchestral music and concerts, devised to attract as many music lovers as possible, provide a range of music from popular to serious in carefully planned programmes and at the same time give its members the chance to enjoy becoming familiar with repertoire. Chesterfield Symphony Orchestra is a registered charity no. 512769. Chesterfield Symphony Orchestra - Chesterfield, Derbyshire. England. Thanks to Sam Reed Photography for our photos.